An alloy is simply a mixture of metals melted together to form a new metalwith characteristics distinct from those of the metals from which it is made. What is a steel alloy? Some make the iron not rust (chromium and nickel), some make the iron possible to harden with heat treatment (carbon), Some make the iron easy to machine (lead), and so on. By varying the type and amount of the alloying element, even in minute quantities, a huge range of steels is produced, used for a myriad of industrial purposes. Why does Hot Rolled Steel have a rough, blue-grey finish, while Cold Finished Steel has a smooth grey finish? Hot Rolled Steels are just that - They are heated up red-hot and pushed through rollers that squeeze the metal, literally squishing it into a particular profile, depending on the shape of the rollers. The process takes a long time, and because the steel is so hot for so long in the open air of the steel mill, the surface of the metal has has a long time to oxidize, producing a thick, tough oxide scale with the characteristic blue grey finish of the final product. Why are there so many shapes available in Hot Rolled Steel and so few in Cold Finished Steel? Steel is a very tough material when it is cold. However, if it is heated past a particular temperature (usually a red-heat) it immediately turns plastic and can be bent, formed, hammered, and squeezed very easily. For example, few of us would be able to bend a bar of 1" thick steel at room temperature no matter how hard we tried, but if the middle of the bar were heated until it glowed a healthy cherry red color (about 1650 degrees Fahrenheit), most of us would have very little trouble bending the bar back upon itself until both ends touched. And when it cooled it would regain it's toughness and strength in that bent condition. This means that the intricate profiles apparent in, say, a Beam or Channel are formed fairly easily in the hot condition, but would be impossible to produce in the cold condition, and only flat, hex or round shapes that are relatively simple profiles are available in Cold Finished Steels. Can Hot Rolled Steels be chemically colored or patinated? No. The chemical coloring of metals relies on the action of the chemicals with the metal itself. The only surface exposed on a Hot Rolled Steel product is the blue oxide scale, which is virtually inert. In order to color the metal, either the grey of the base metal must be exposed by grinding and then can be colored, or pigmented lacquers or paints must be used on the surface. Because the surface is rough, it takes paints and lacquers very well. 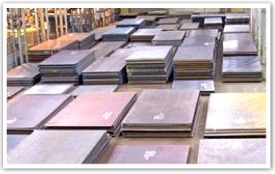 1) Hot Rolled Steel products are NOT a consistent blueish color. This is particularly true with hot rolled sheet, over the surface of which the color varies dramatically, more blue at the edges, more grey in the center of the sheet. 2) The shapes available in hot rolled steels are available in 12ft, 20ft, and sometimes 40ft lengths, ask us, we can tell you what is available..
3) The blue scale finish on hot rolled products is incidental to the process of producing the product, and so, is not controlled in any way. This gives rise to fairly strong inconsistencies in the finish, particularly in sheet and plate. 4) Again, the blue scale on the metal prevents any chemical coloring on the surface of the metal unless the scale is removed, exposing the bare metal beneath. 5) Most hot rolled products are very soft and bendable. This is really only noticeable in the smaller bar sizes, but it can affect the final product if you are relying on the product to take a lot of strain. If you are looking for a stiffer product, use Cold Finished Steel. 6) Hot rolled plate is a very rough product, and should be treated as such. 7) All hot rolled products weld, bend, drill, and form very easily, and as well are the least expensive of the steels, giving rise to the least expensive finished product of any of the steels. 8) Nearly all metalwork involves welding or soldering the metal. How those welds are addressed is often the difference between a hack job and good craftsmanship. If hot rolled steel is welded, either the un-dressed welds are left as a part of the aesthetic, or they will have to be ground down by hand. Grinding and dressing the welds, of course, removes the blue scale at the weld zone while leaving the blue scale on the rest of the material. This aesthetic difference must be addressed at every weld. It is possible to return the color, but not the texture, of the blue scale at the ground weld joint where the metal has been exposed by heating up the joint red hot and allowing to cool. 9) A reminder - Pipe is specified by the inside diameter, Tubing is specified by the outside diameter. 10) Hot rolled steel stock products mostly have a rounded appearance at the corners and edges and relatively inexact dimensions, whereas cold finished steels are much smoother and more precise.